Mmmmm, hot and gooey cheese, mind-blowingly amazing Alfredo sauce, yummy lasagna noodles with a salad and garlic bread on the side. Sounds amazing, right? Yeah..admit it. You know that it does. I love lasagna. It’s my absolute, all time favorite food. A good lasagna recipe can be updated and customized to be anything that you want it to be. That’s why you see so many different variations. 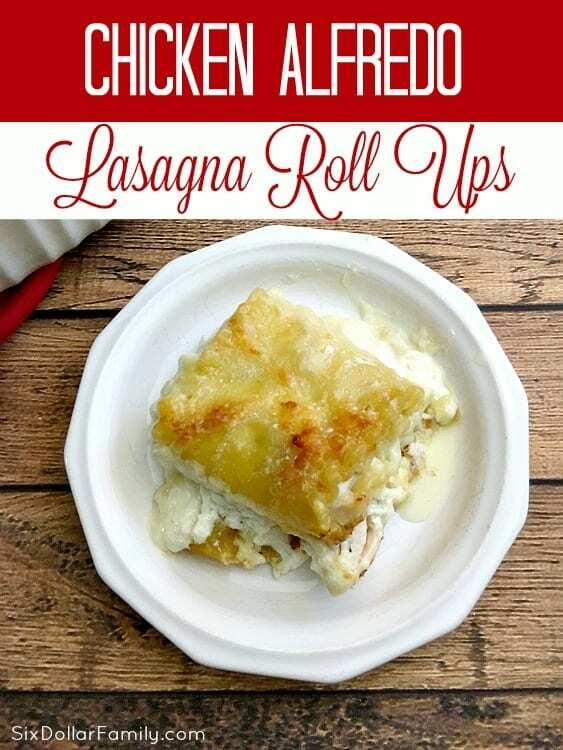 One of my favorite ways to vary from the same old lasagna recipe is by making these amazing chicken Alfredo lasagna roll ups! I use my homemade Alfredo sauce recipe in them and trust me. That makes all of the difference! The secret to why this chicken Alfredo lasagna tastes so amazing is the homemade Alfredo sauce recipe that I use when I make it. As sauces go, it is ahhhhmazing (in the words of my 11 year old). It’s rich, creamy, garlicky without being overpowering and of course, oh so cheesy! It’s also not incredibly hard to make like some Alfredo sauce recipes that I’ve seen. I’ll let you trust me and make it for yourself, but trust me on this. It’s the best Alfredo sauce recipe that you will ever taste. I’ve always been a huge fan of chicken Alfredo, but after years of making the same old chicken Alfredo recipe over and over again, you can start to want a change. That’s why this recipe is so great! It’s different from the same old chicken Alfredo recipes that we’re all used to but has that classic taste that we all love so much. If you’re looking for recipes to use in a freezer cooking session, this one is great! To freeze, bake as directed then freeze in a 9 x 13 foil baking pan with a lid once fully cooled. When you’re ready, bake it from frozen at 350 degrees for 45-60 minutes or until hot in the center. Don’t thaw it before you cook it. The sauce will separate into a oily mess if you do. This recipe can be made in one of two ways. First, you can make them as lasagna roll ups like I show in this post. The other way you can do it is to simply layer it like you would a traditional lasagna. 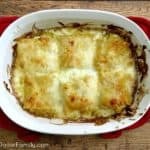 When I add this to my freezer cooking list, I layer it since it seems to freeze better as a lasagna than it does individual roll ups. When I make it fresh, I do individual roll ups. As I give you the recipe below, I’ll give instructions for both so that you aren’t confused as to what you’re doing. If you’re looking for an amazing chicken breast to use in this recipe, I love using Zaycon Foods Chicken Breasts in it! They’re so big that I only need to use a couple and they taste so much better than what I get at the supermarket! Plus since I usually get a killer deal on Zaycon Foods deliveries, I can save when I’m making it! Now that we’ve got that out of the way, let’s make us a lasagna! To begin, cook your lasagna noodles al dente according to the directions on the package. Cook the chicken until done then chop or shred. I like to use my Instant Pot to cook the chicken breast since it makes things so much easier. Just pop the chicken into the Instant Pot and go! Next, in a small mixing bowl, combine the ricotta cheese, cottage cheese and all seasonings together. I haven’t given you amounts for the seasonings since they should be to taste. Usually I use a couple tablespoons of each and save a bit of the italian seasoning to sprinkle on top. 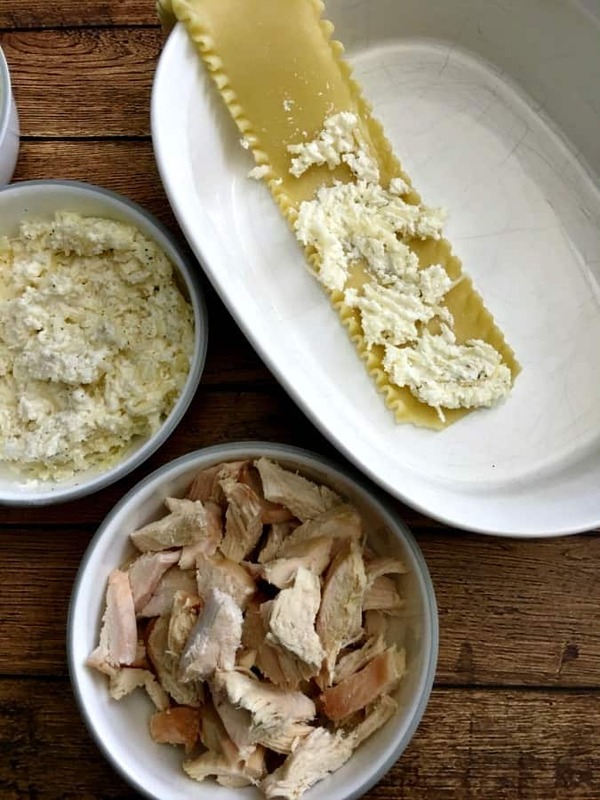 Once you have the prep steps done, take a single lasagna noodle and spread a thin layer of ricotta cheese on it making sure that you only go about halfway up the length of the noodle. Next, sprinkle a bit of the chicken on top of the ricotta cheese. Again, only go about halfway up the length of the noodle since you will be rolling it over. Top the chicken with a small amount of mozzarella cheese. 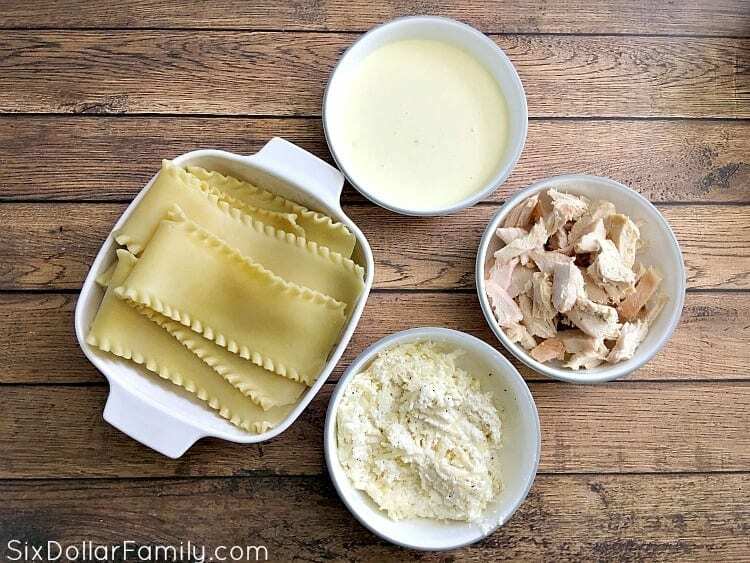 Line the bottom of your casserole dish with a tiny amount of alfredo sauce to keep your lasagna roll-ups from sticking. Then, grab your lasagna noodle and starting with the end that has the chicken/ricotta mix, roll it over and over itself end over end. 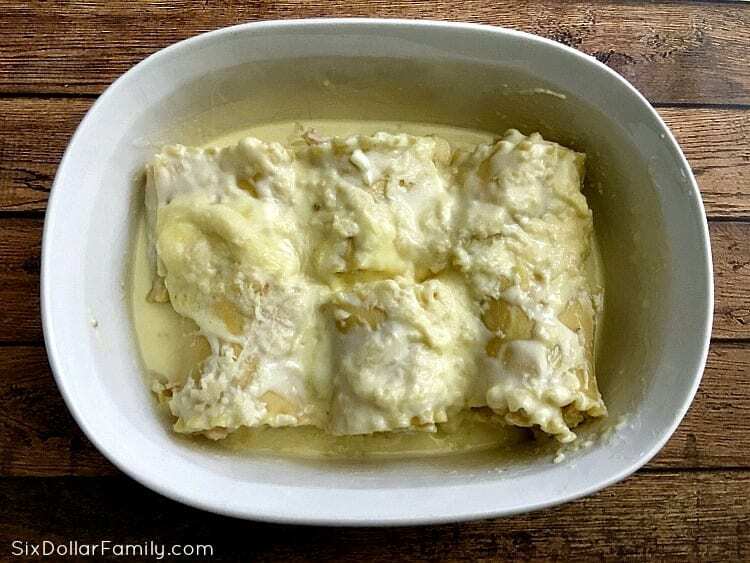 Place each chicken alfredo lasagna roll up into your casserole dish until you can’t fit anymore in. Next, spread the alfredo sauce over the top. If you don’t have enough sauce, just spread it out like I’ve done in the photo. Top the alfredo sauce with the remaining mozzarella cheese. 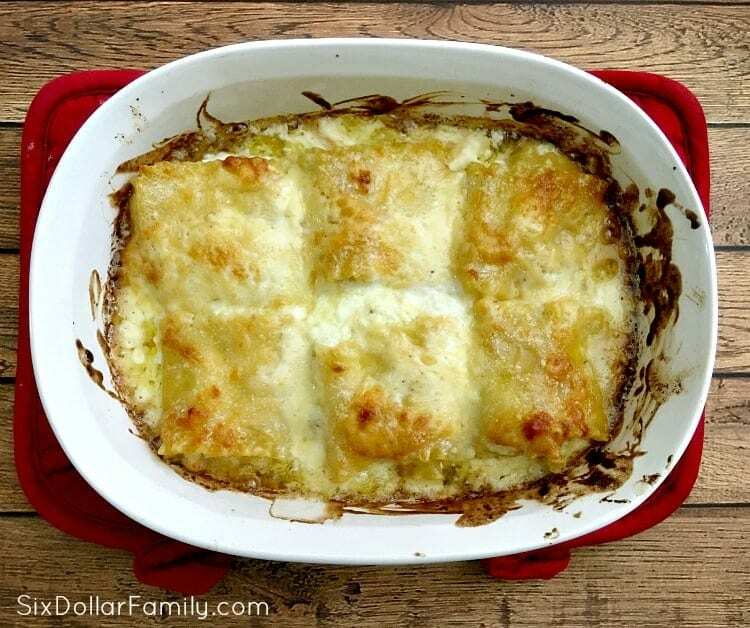 Bake your chicken alfredo lasagna at 350° F until hot all the way through and the cheese is melted and bubbly. Let it rest for 5 minutes before serving and serve hot! This goes amazing along side of a salad and garlic bread! 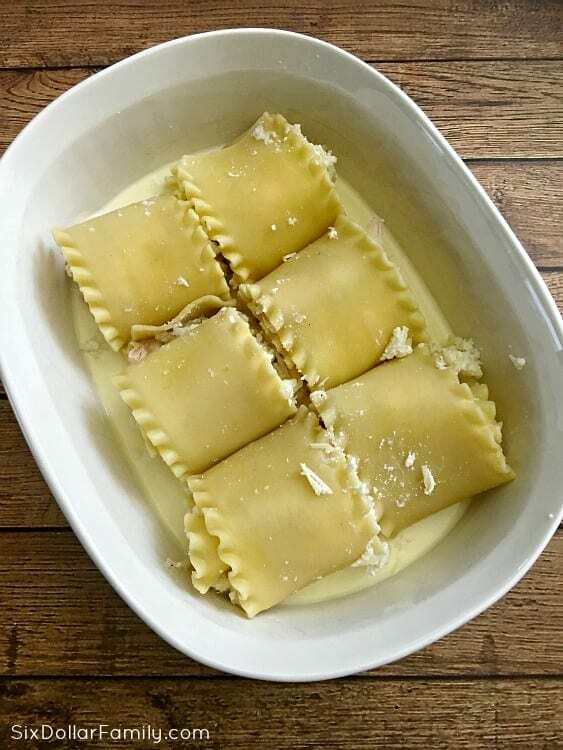 If you’re making a chicken alfredo lasagna recipe instead, the ingredients are the same, but you will likely need more alfredo sauce than you do for the roll ups. Layer a thin layer of alfredo sauce on the bottom of the casserole dish then layer in this order: Noodle, ricotta/cottage cheese mix, chicken, alfredo, mozzarella. Finish your top layer with mozzarella and bake for 30-45 minutes or until heated and the cheese is melted and bubbly. cook your lasagna noodles al dente according to the directions on the package. Cook the chicken until done then chop or shred. In a small mixing bowl, combine the ricotta cheese, cottage cheese and all seasonings together. 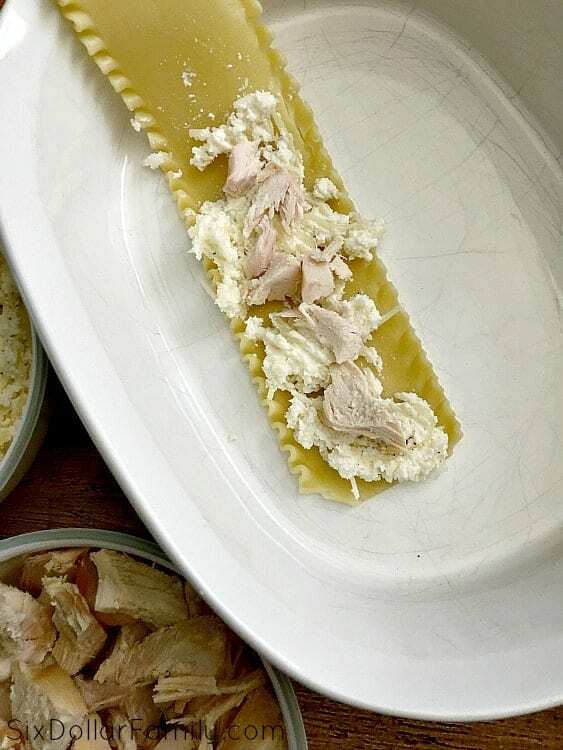 Take a single lasagna noodle and spread a thin layer of ricotta cheese on it making sure that you only go about halfway up the length of the noodle. Layer chicken on top of the ricotta. Roll noodle end over end starting with the chicken side. Fill casserole dish with roll ups. Bake at 350° F until heated through and cheese is melted.